Title: Legal Office Procedures Workbook, 7th Edition, 2017. For law clerks, paralegals, and legal assistants. 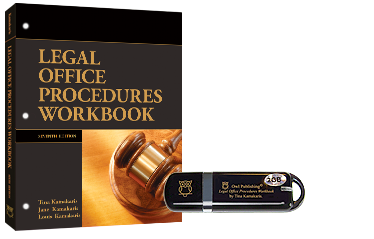 This well-known and highly respected Legal Office Procedures Workbook is designed for Canadian college-level law clerk, paralegal, and legal office programs. It contains practical assignments that are correlated to each chapter in the Legal Office Procedures textbook and covers an entire legal curriculum. The student works on easy-to-use start-to-finish legal files, including interfacing files and legal templates, that are pedagogically designed to unfold incrementally, providing the student with legal context and continuity for a meaningful application of substantive and procedural law. The assignments encourage the student to apply initiative, good judgment, critical thinking, and problem solving. USB flash drive uploaded with easy-to-use interfacing templates and assignments. “Your College Letterhead” template for use at your particular college. Client files carried from retainer to account. Press perforated pages for easy removal of hand-in pages.